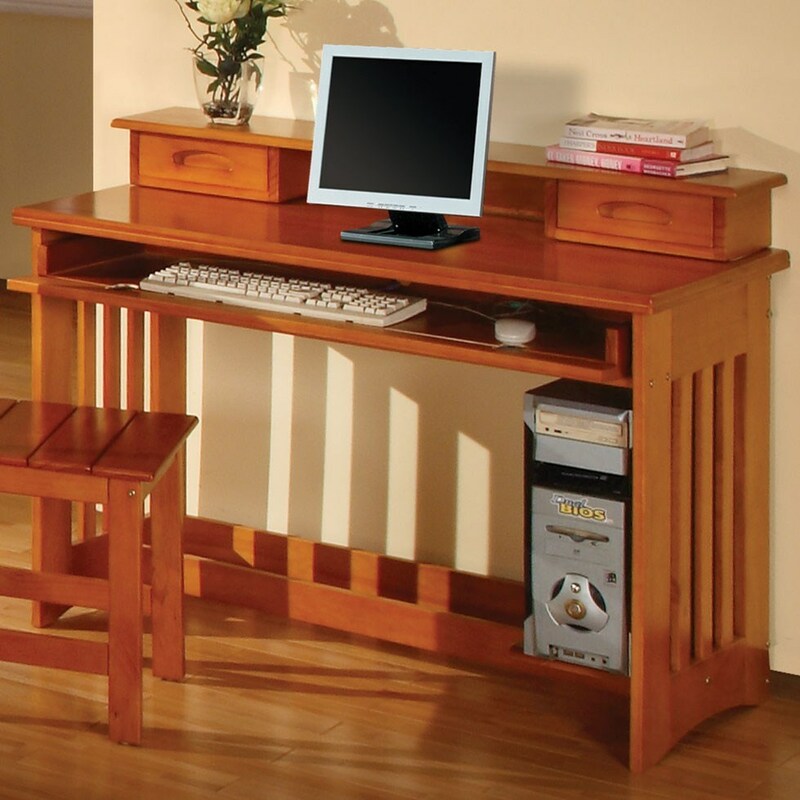 This writing computer desk with hutch is perfect for any student. One roll-out and flip-down drawer can hold a keyboard and mouse, with a bottom shelf for electronic storage. 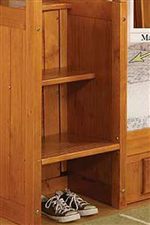 The mission style design features slatted sides and a warm honey finish with a top lacquer coat over pine. Pair with the matching desk side chair for the complete set. The Honey Mission Honey Writing & Computer Desk with Hutch and Drop Front Drawer by Discovery World Furniture at Virginia Furniture Market in the Rocky Mount, Roanoke, Lynchburg, Christiansburg, Blacksburg, Virginia area. Product availability may vary. Contact us for the most current availability on this product. Though the Honey collection features rustic mission design details, like wood slats, carved drawer pulls, and wood paneling, the youth beds in this collection are a good fit for either a boy or girl and work well with just about any style of decor. These bunks and captain's beds are the ultimate "big kid" beds, fun enough for adventurous games of pretend, and sturdy and safe enough to ensure responsible play times. 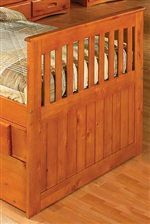 Moms and dads will love these beds, too, for their rustic style and nifty drawers and shelves for extra storage. The Honey collection is a great option if you are looking for Mission furniture in the Rocky Mount, Roanoke, Lynchburg, Christiansburg, Blacksburg, Virginia area. Browse other items in the Honey collection from Virginia Furniture Market in the Rocky Mount, Roanoke, Lynchburg, Christiansburg, Blacksburg, Virginia area.